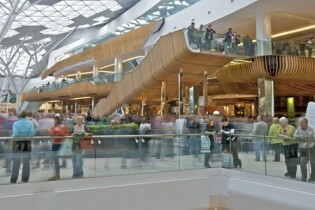 The opening of this prestigious, new and vast shopping experience certainly lived up to the hype. The VIP evening event saw us constructing a 7.5m high white proscenium arch, a main stage, two catwalks, an orchestra pit and a large white ‘boxed’ backstage area, all in Westfield’s Main Atrium. Unusually, the backstage area included internal tunnelled walkways, providing a fashion pre-show relayed to screens on stage.